Here’s a fun way to recycle some every day items into something useful. 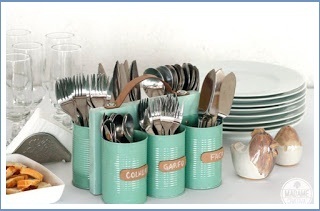 Take some tin cans and a scrap piece of wood and put them together into a nice cutlery holder. I can see this working perfectly during parties on the back patio. If you usually do dinner or barbecue at home and invite enough people, you know leave the table organized with the silverware in sight greatly facilitates the life of the host. This prevents guests stay wondering where to find the items and avoid that comes and goes in the kitchen, opens and closes drawers. We made ​​this door cutlery that even though it was done with simple and recycled materials was cute. But what I like most of this cutlery door is practicality! I open the drawers, put everything separately in cans and take at once to the dining room. Has to handle to handle! If you want to use for other purposes as well? It ​​works! 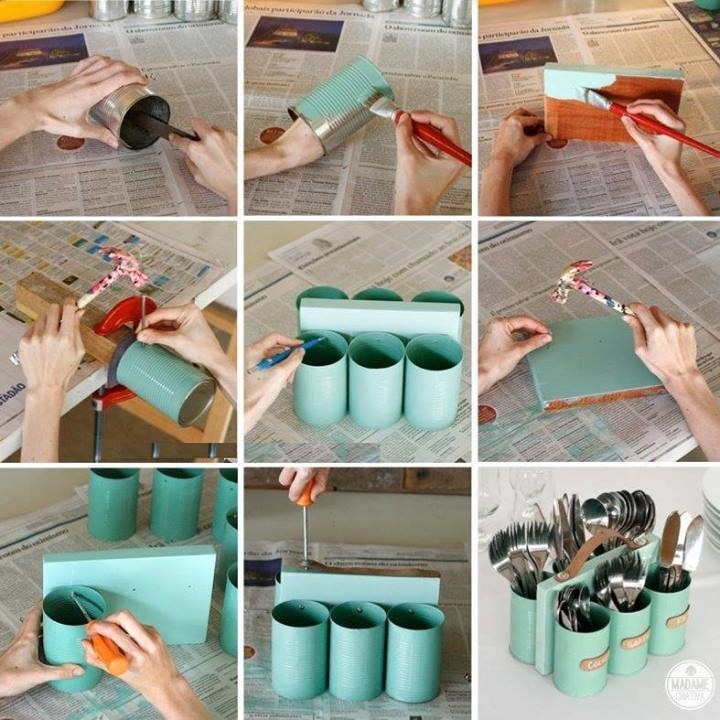 If you have children at home, this project will be useful as a pencil holder. If you are craftsman, can use as tool holders ... Everyone can find a function. If you Usually invite your friends for a barbecue or is having dinner at your house, you know que organize the table with the cutlery in sight makes life much easier. This Prevents guests stay wondering where to find the knives forks and spoons and Avoids Them to keep opening and closing the drawers.